Trip boat from Riley green on the Lancaster pound of L&L canal at Haigh. Nice to see people enjoying them selves boating. Would have thought they would have worn life jackets while they are clinging onto the side of the barge. Can't see any phones.....they must be enjoying themselves! Good for them! I hope they had a good cruise. We have fond memories of our trips. Lovely scenery, good people, great scenery. One really happy afternoon we spent ascending the Wigan Flight on a summer Sunday afternoon. Wonderful. Nothing much to be said here! Just a boat trip! The girl/boy grippin the rail wants to be careful! Looks like fun, wish I was there. Pretty substantial ships bridge/garden shed at the back complete with windscreen wipers, I bet that's ideal for rainy day running. Whose Jason Grimshaw?? ?Am I missing something??? That explains it...I don't watch it! I don't blame you Alan you aren't missing anything! I can't stand any of those soaps! Doom and b-----y gloom! Predictable storylines that make you want to scream! As soon as I hear the theme tunes if I have nodded off I jump up quick and turn the buggers off! 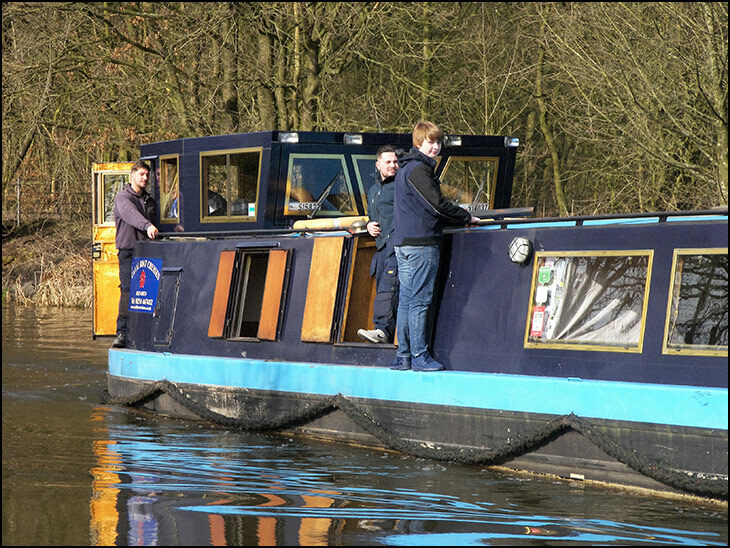 On canal boat safety- the standard instruction on what to do if you fall overboard is, 'Stand up!' Usually you can. These "soaps" are suppose to portray life realistically...They throw in issues so removed from normality...Give me Ena Sharples, Martha Longhurst, Jed Stone and Denis Tanner anyday! And as for Eastbenders...forget it! Heartbeat was the best. 1960s great. 'Allo,'allo ,Rising Damp, Open All Hours, Only Fools, It Ain't Half Hot, Dad's Army,Steptoe and The Two Ronnies (fork handles 4 candles)! I could go on.......! That's just a few. Think I had better shut up now! Vb those tv programs are comedies not soaps. But they were good weren't they?